Found this lovely bit of a wisdom on ‘SignatureSterling’s‘ creative blog this morning. 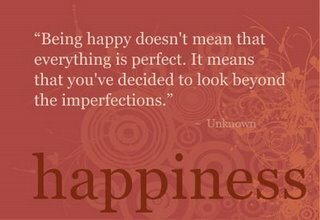 I love quotes and this one is such a great reminder..
§ 8 Responses to >Being Happy..
>how true. how true. nice reminder!! >Hear hear, that is a great quotation! >This is great thought indeed. Thank you for the reminder of the true meaning of the happiness. The quote was grand, yet your blog attracted me much greater. The Beauty just radiates from each single spot here and does that independently of my attitude towards her. Your blog is just wonderful and thus the viewer has only one choice – I bow to you. THANK YOU. >I love it. Thanks for reminding us :-). Gorgeous work! You are currently reading >Being Happy.. at fireandglass.